Yes, Barbie Can Now Talk! Is this cool or creepy? Today in awesome news! Mattell—the toy company behind Hot Wheels and WWE action figures—has decided to give Barbie a major upgrade. Introducing Hello Barbie, who looks exactly like the classic Barbie, only this new one can actually talk. And we're not talking about pre-recorded voice messages that say "Hello!" or "I think you're pretty" at a push of a button. Hello Barbie can actually carry a conversation. Using speech recognition developed by the braniacs at ToyTalk, Hello Barbie can respond to whatever you—err, we mean a kid—says. So let's say a kid says that she really enjoys her English subject. Hello Barbie pays attention to that detail, and uses that tidbit to either respond (like an actual friend would), or Barbie could use that tidbit for future conversations. Oh, and that's not the only upgrade. Barbie can now also wear flats! Since the doll's feet were designed to have high arches, she's never actually worn flats before. Ever! 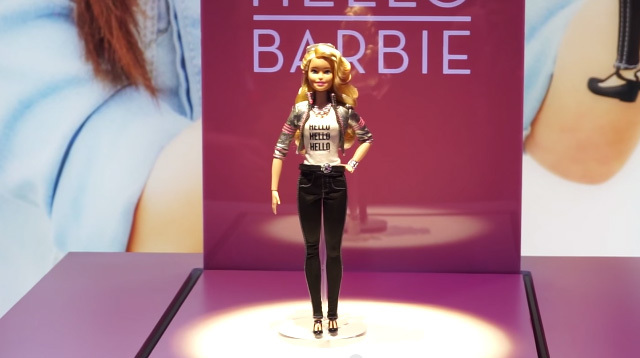 Hello Barbie will be the first Barbie to have "articulated ankles" so she can wear sneakers. Or ballet flats. Or basically anything that won't involve ridiculously high heels.